A trip to St Ives by train is possibly one of the best child friendly days out in Cornwall. 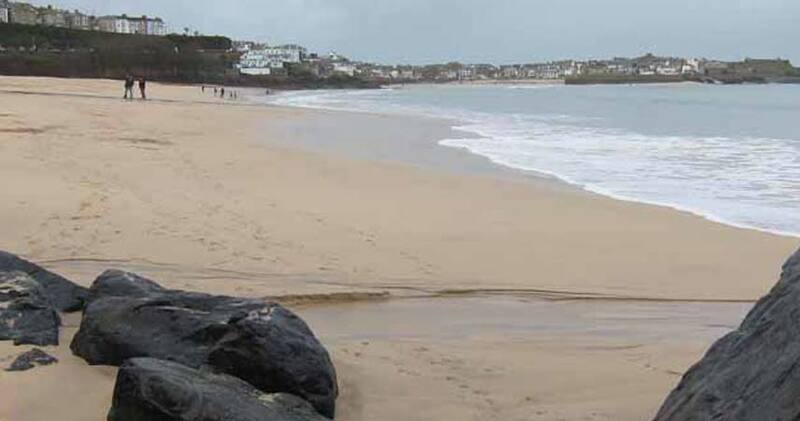 The St Ives Bay Line is one of the most picturesque branch lines in the country, and kids of all ages will feel the anticipation building as the stunning stretch of coastline comes in to view. All aboard! St Ives has plenty to offer families all year round, but the advantage of going off season is that you can avoid the crowds. The train journey from Truro to St Ives takes a little less than an hour, depending on connections. You change at St Erth from the main line to pick up the branch line which hugs the coastline via Carbis Bay. Wilf and Megs went scrambling over the rocks on the beach and met a lovely little Jack Russell dog to play with. Then it was onwards towards the centre of St Ives for a warming hot chocolate at another of Nanny Pat’s favourite watering holes, the Pedn Olva Hotel, which right on the beach. They’re open all year for food and are very welcoming to families with children. Go into the lounge bar to enjoy the outstanding views over the beach and harbour – you might have to pinch yourself to check you’re not dreaming! The tide was out leaving the characterful little fishing boats bedecked with nets and floats stranded on the sand which led to discussions about how the lifeboat got out when the tide was out! St Ives has beaches galore, and Nanny Pat, Wilf and Megan worked their way around them all – Porthmear, Porthgwidden, Harbour beach and Porthminster – and ended up at the Tate. You can go up to the rooftop cafe for free and savour the magnificent view yet again (be careful of marauding food-stealing seagulls in the summer). Wander back through the narrow streets, stumble across the hidden artists’ studios and galleries and indulge yourself in the souvenir and craft shops on the way back to the station. A brilliant day out all round! Nanny Pat started her journey in Truro. They parked at the station (£2.50 all day on weekends). A railcard, the cost for Nanny Pat plus a four and a six year old, the return fare was an amazing £7.50 – a great day out for £10 if you take your own packed lunch – bargain! If you’re staying at Bosinver you could start your trip at nearby St Austell station. For timetables prices and inspiration, take a look at the Great Scenic Railways of Devon and Cornwall website, which is packed full of great ideas for alternative days out. Alternatively, you could drive to Leland Saltings (around 50 mins drive from Bosinver,) and pick up the branch line there. There’s a large car park there (postcode for Sat Navs: TR26 3DL) and trains run every 30 minutes, Monday-Saturday, although they’re less frequent on Sundays. Have you visited St Ives with your family? We’d love to hear about your experiences. What would you recommend for the perfect child friendly day out?